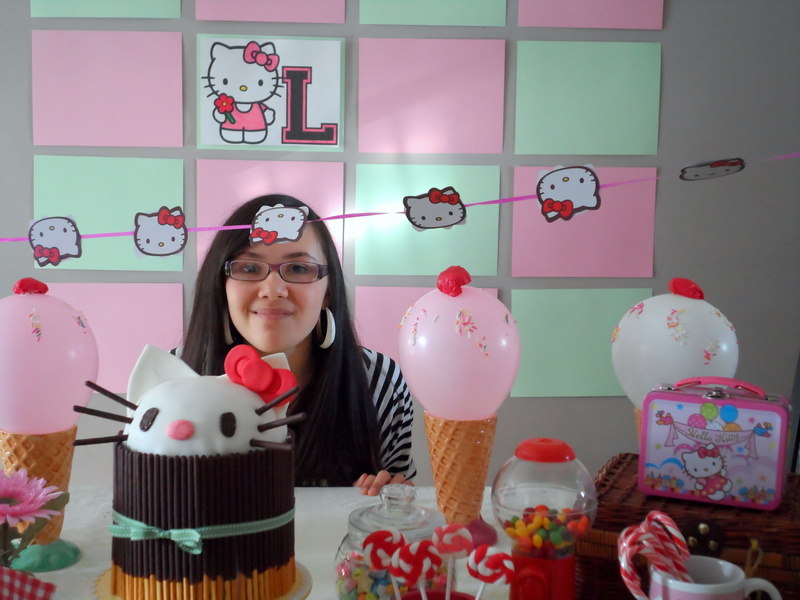 The Hello Kitty Party!! or “La Fiesta de la Hello”! 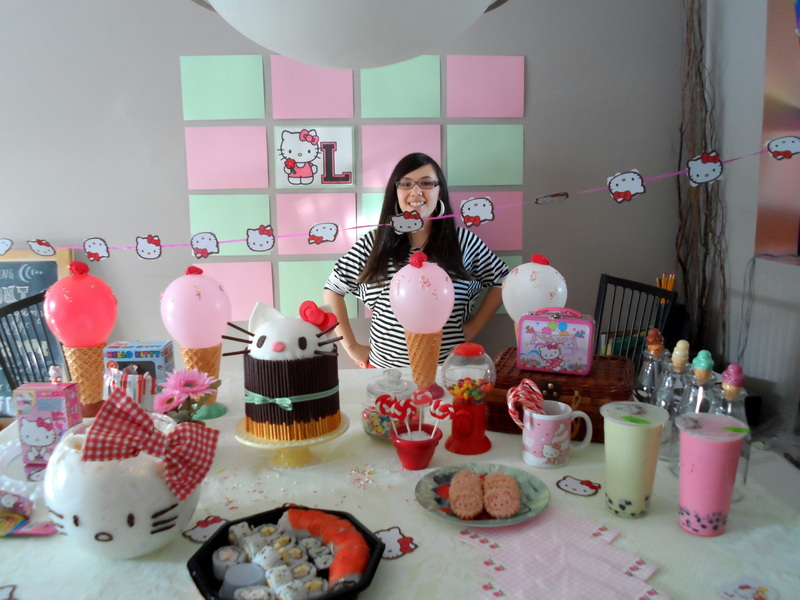 I had been thinking for a long time that a Hello Kitty party would be fun, but here are the two things that made me feel really inspired to go ahead and go for it!! 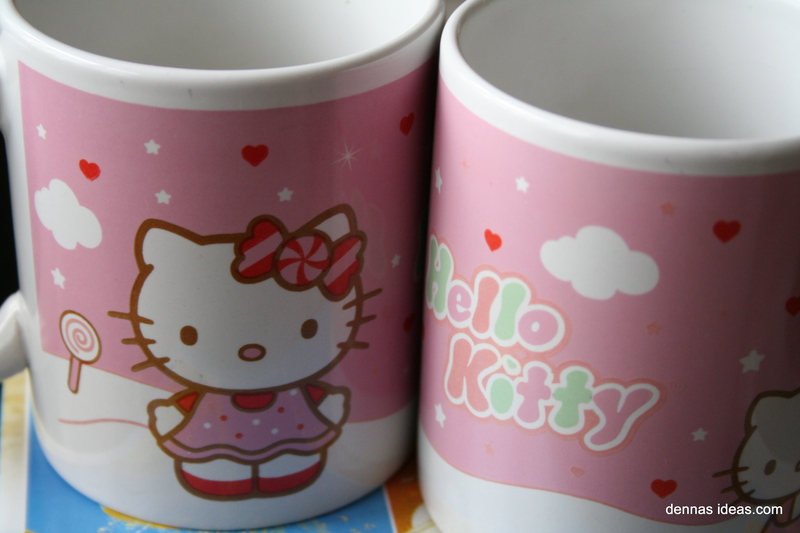 and this Hello Kitty mug! My photos of the mug didn’t turn out so great, but really the mugs were my inspiration for the party. The girls have had them for years, and I am always seeing them! 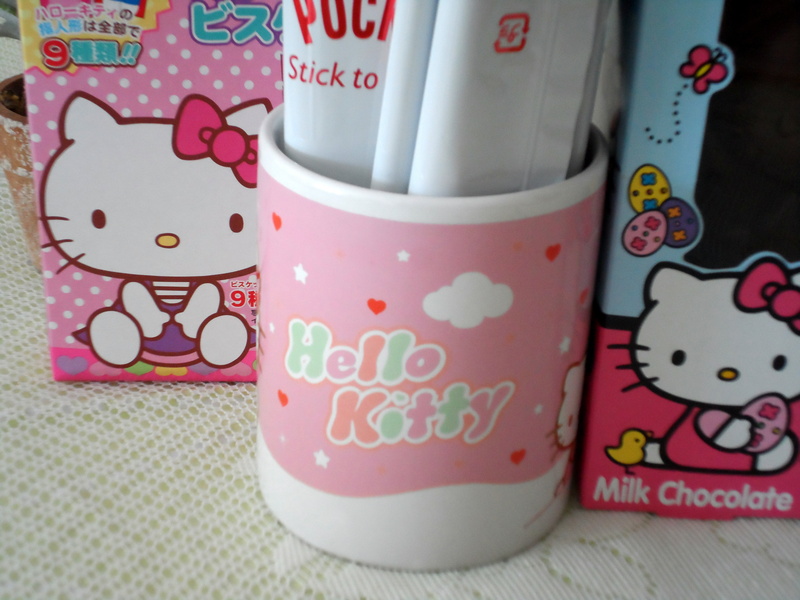 The mugs have Hello Kitty with ice cream cones and candy, and they are done in these pastel colors. So I decided that the colors for the party would be mint green, pastel pink and red, oh! and chocolate instead of black! 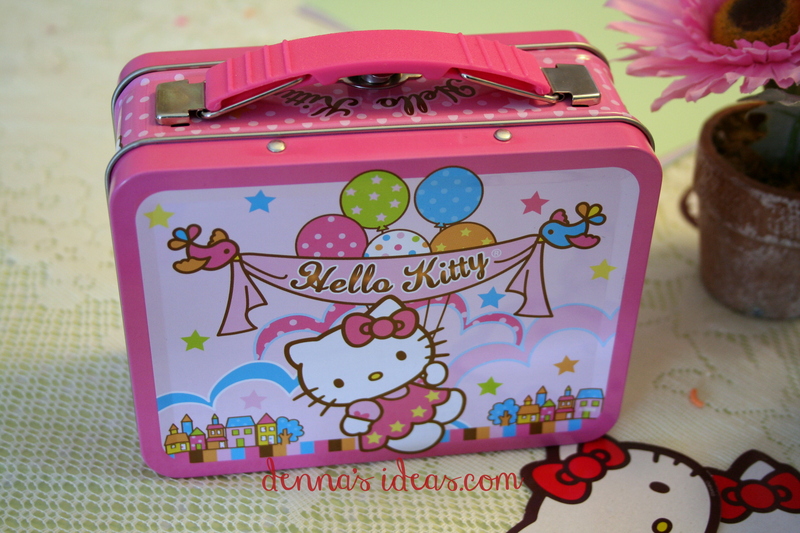 And that it would be a Hello Kitty Sweet Shoppe kind of theme! 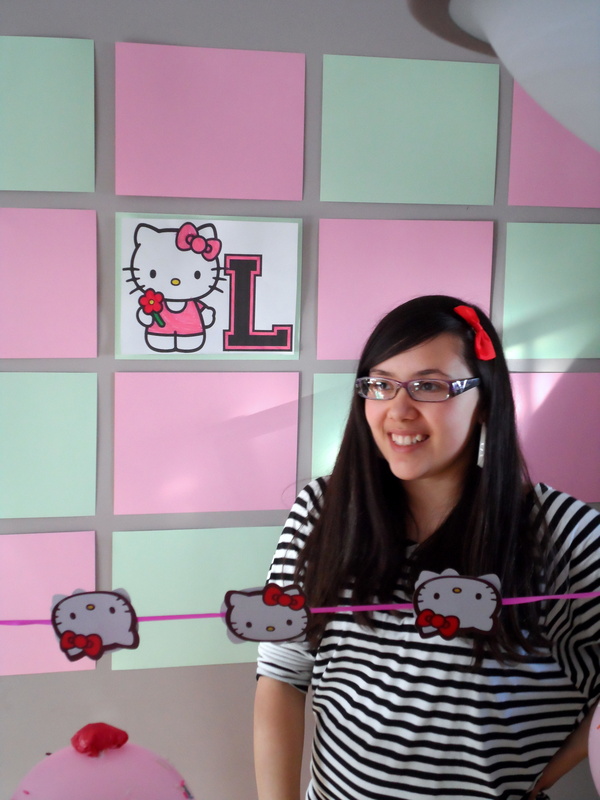 Following are some easy how-tos for some of the Hello Kitty stuff we did for the party. Links to sources and how-to posts are in red letters, so just click on them! 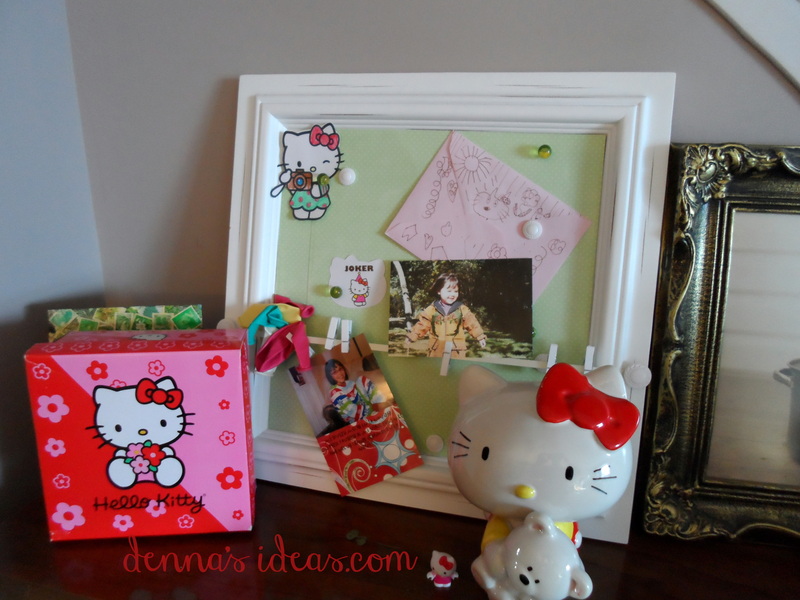 So mint and pink and red….and a little white cat! A package of pastel card stock from the dollar store made a quick and easy backdrop. Just tape the pages onto the wall with painter’s tape so they won’t stick forever! (We were able to print out one black and white kitty and my youngest colored it in. We found it on this site of coloring pages). The lighting in our house in the winter is just atrocious, and so all my photos look kinda strange…they look very brightly colored, but really are softer pastels, oh well, I guess you get the idea…. 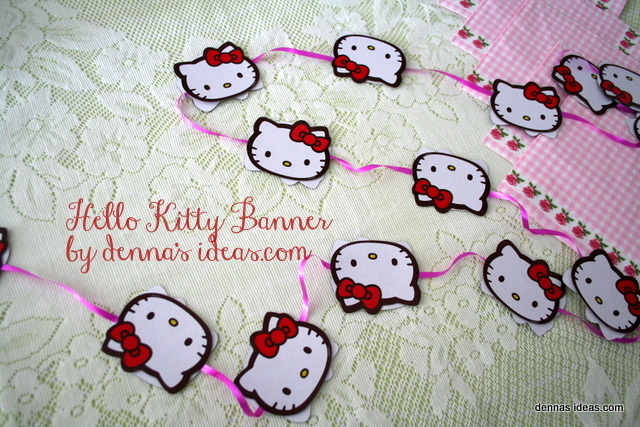 The little Kitty banner was so fast and easy to make. 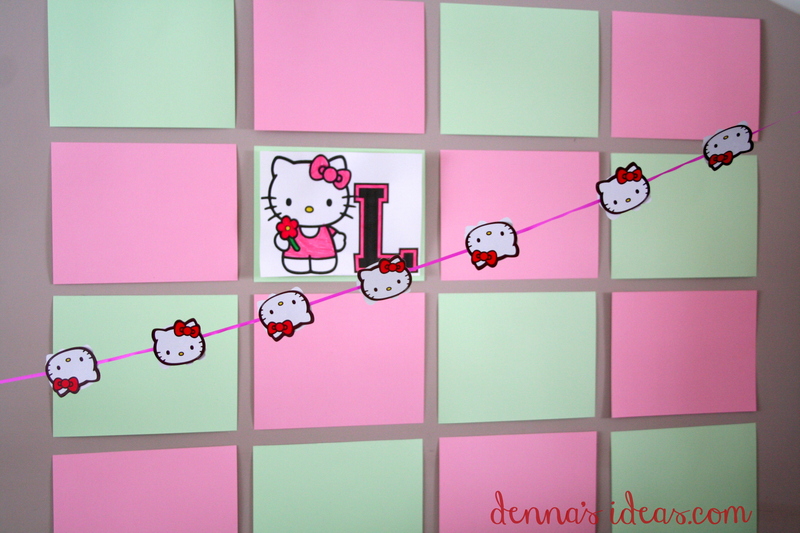 Check out the How-To here for a quick and easy Hello Kitty banner. 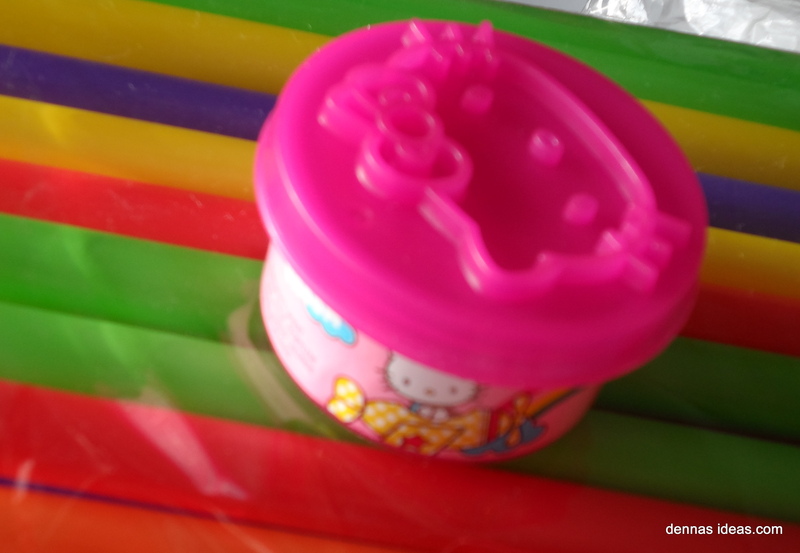 A trip to Party City for a few little party favors, and a trip to the T&T Asian supermarket for some fun Hello Kitty packs of gum and box of cookies! 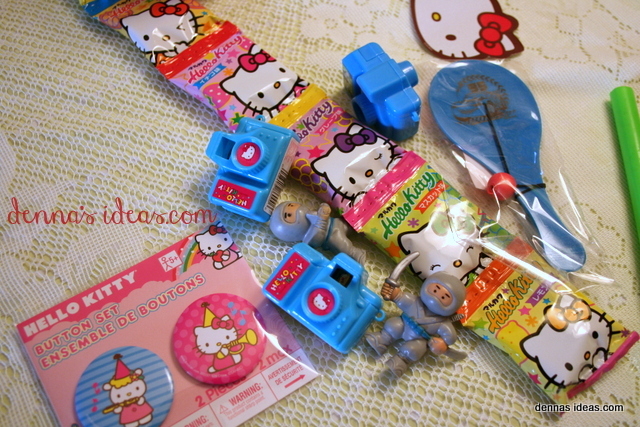 We set out a few of our Hello Kitty memorabilia to decorate… and something new…. And now for the party table set up! 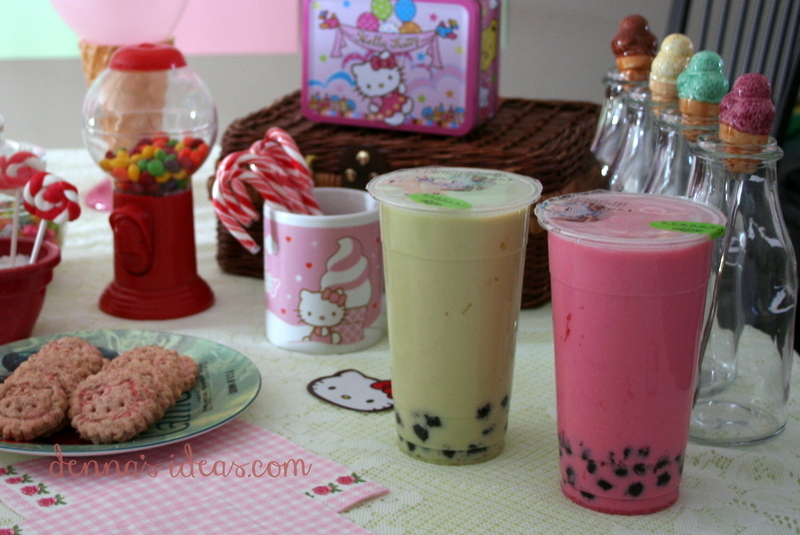 We found some bubble tea in just the right colors…they looked super, but just are not my personal cup of tea! 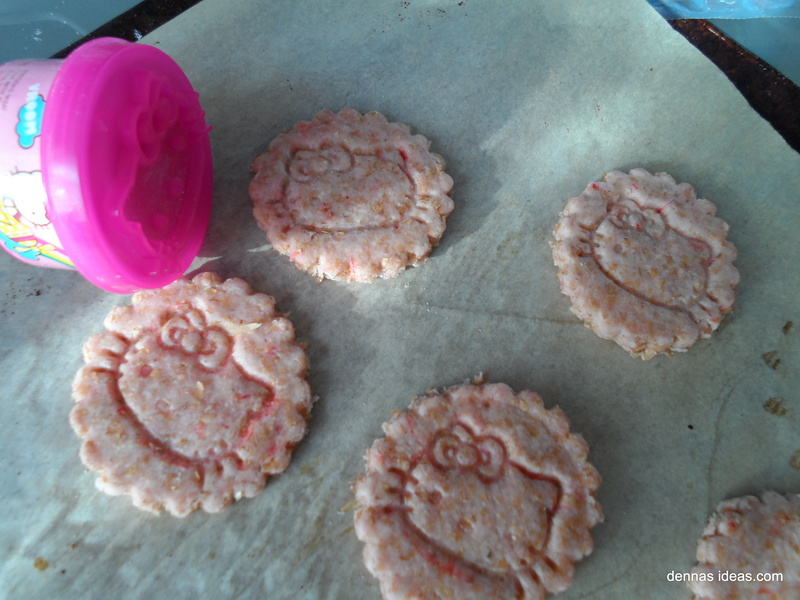 I made a plate of Hello Kitty crackers…um, those weren’t so fabulous, but might work out with a different recipe. 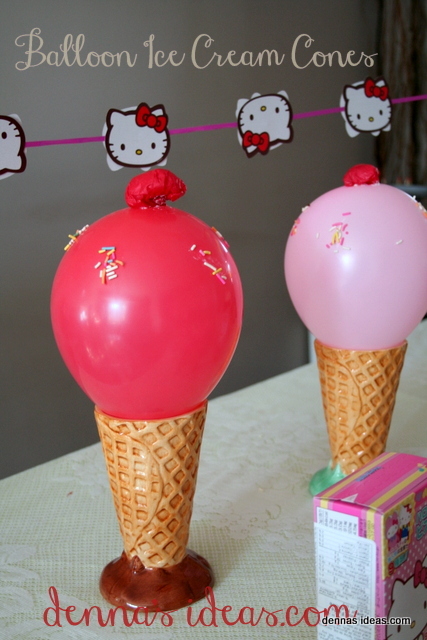 Some easy party balloons in the shape of ice cream cones for the party table. Just add some “cherries” and sprinkles! 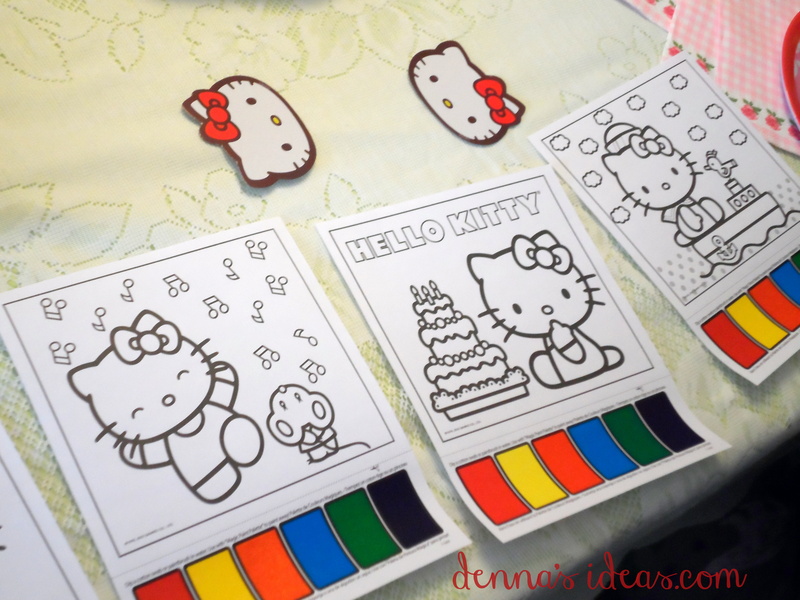 There’s a quick how-to at the end of this post here Everything was finally put together….with the Hello Kitty Cake, too! 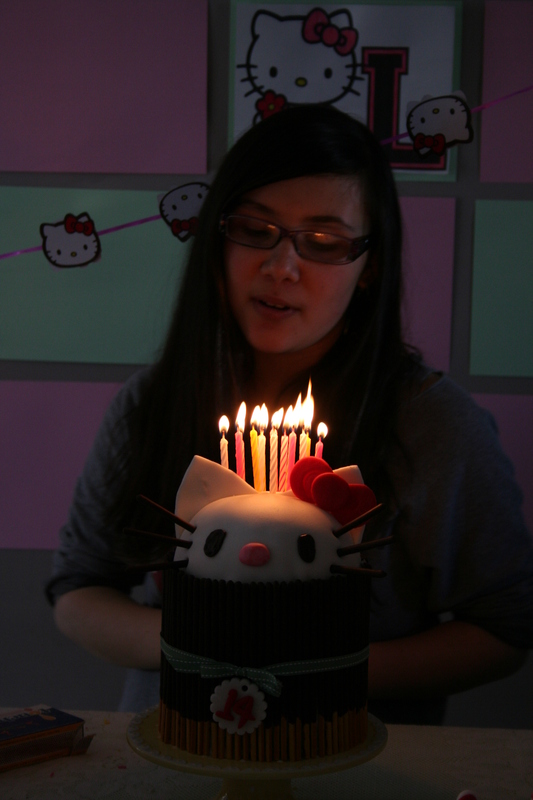 I made a Pocky Cake and added Hello Kitty peeking over the top! Her whiskers are made out of Pocky, too. 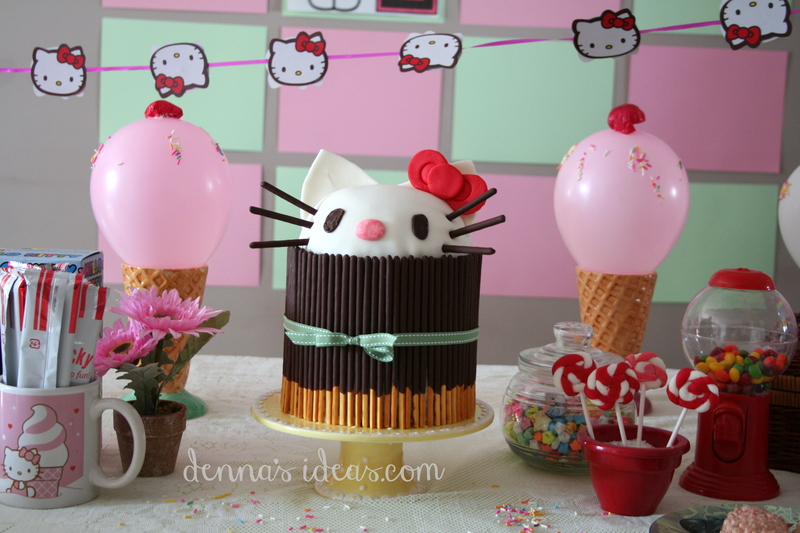 I posted about what a Pocky cake is the other day, what a quick way to decorate a cake!! The salad bowl was really a flash of genius, if I do say so myself!! 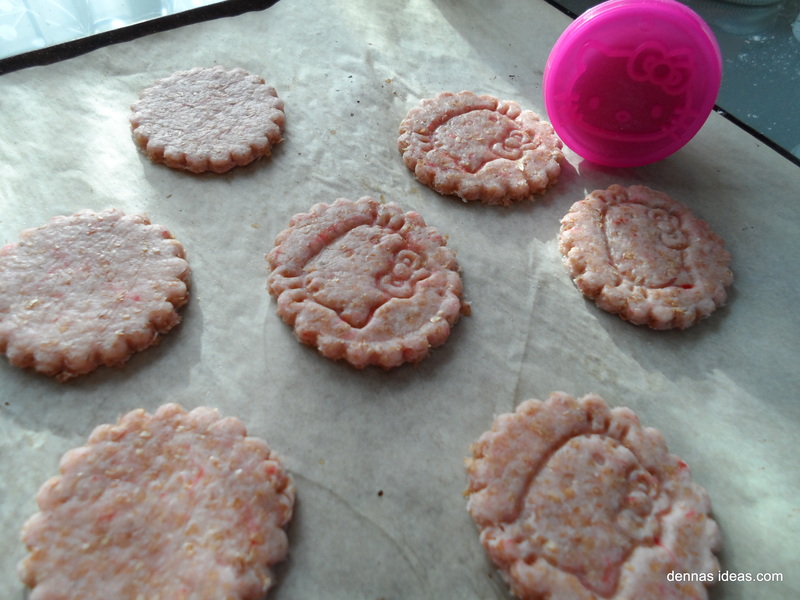 So fun and tasty, but super easy to make, too! My birthday girl!!! 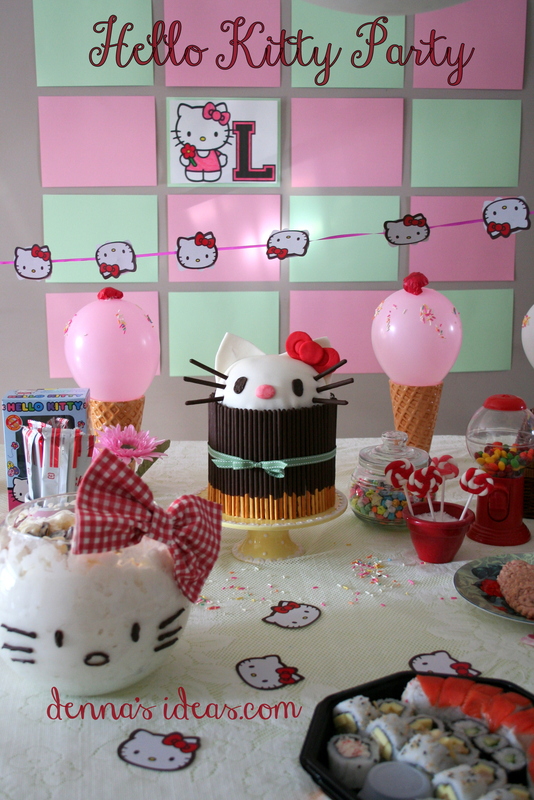 No girl is ever too old for a Hello Kitty party!! 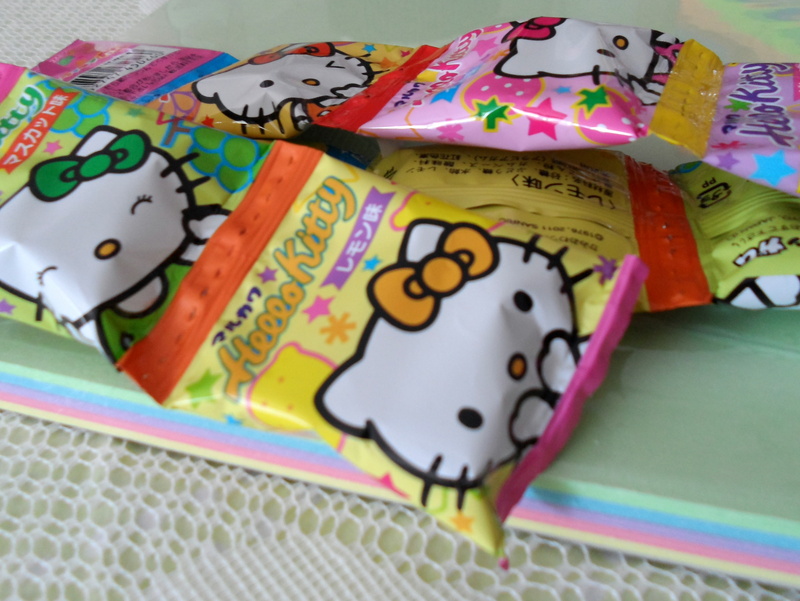 It was a whole lot of sugary pastel colored sweetness, with a few Japanese and Korean treats thrown in! 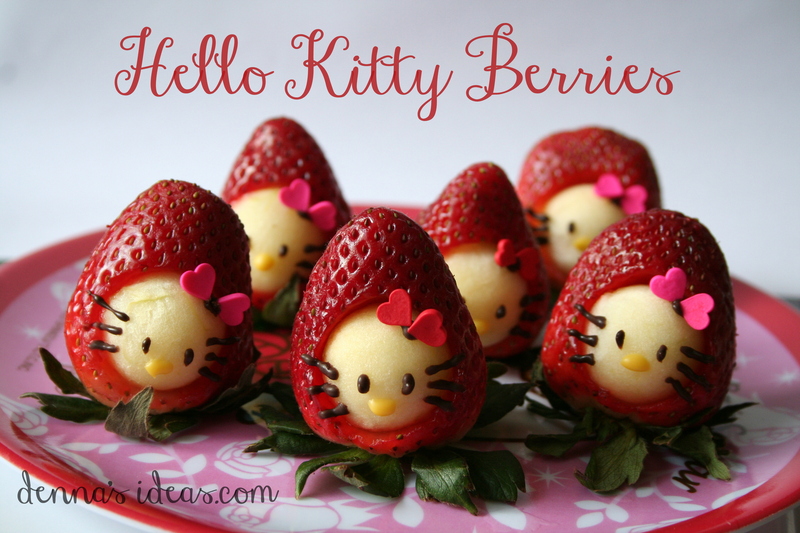 The only things missing were these Hello Kitty strawberry treats!! They were easy to make, but just didn’t make it to this party, haha! The link for the how-to is here. 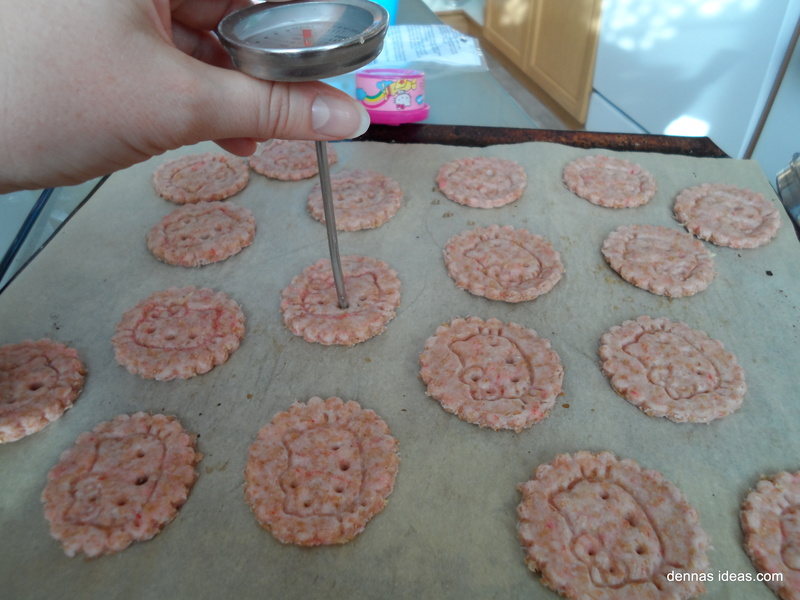 The recipe said that holes should be poked in the crackers so they’d bake alright, so I did, poking Kitty’s nose and eyes with a meat thermometer (clean). When they baked up…they still looked a little weird. And when I tasted them…I wasn’t impressed. They really just tasted like very flat biscuits. Some of them were kinda cute…though the pink color was strange. I was surprised that the kids liked them! 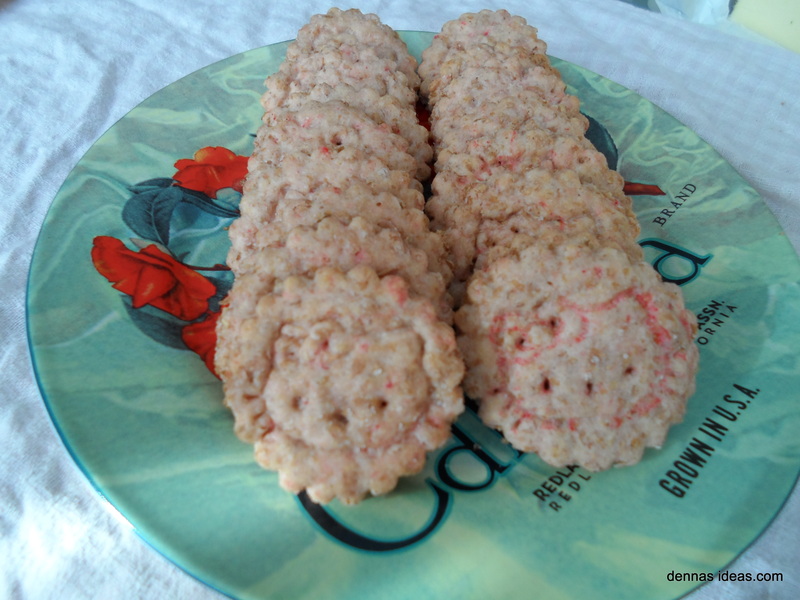 The recipe might have been fine if I had not added whole wheat instead of white flour…. I definitely need to try this again, but will try a different recipe. I think I’ll try a recipe that has cheese in it! You just can’t get enough of that cute Kitty, I know! 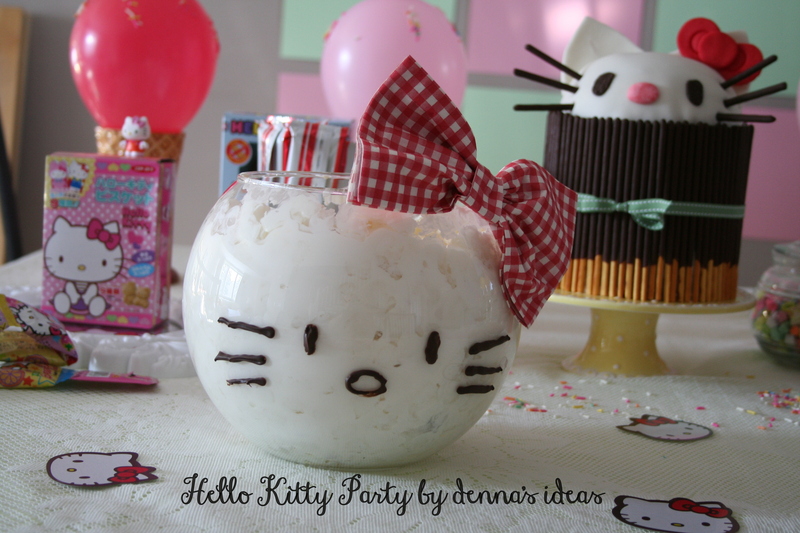 So I thought I’d post just one more party food idea for your next Hello Kitty party. This one turned out great and is super yummy, I promise! One of our favorite “salads” is more like a dessert, I’m afraid. 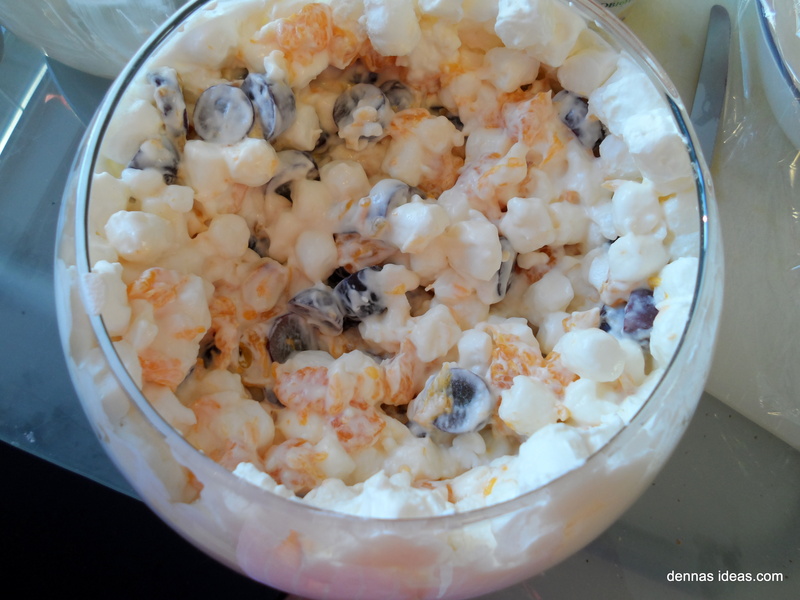 It’s a marshmallow-fruit-whipped cream salad of yumminess…ahhhh. 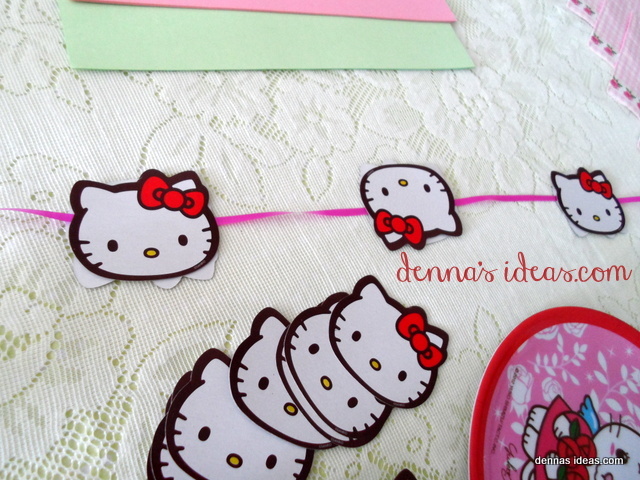 Very easy, and it adapted itself perfectly to this Hello Kitty idea. This food project needs to be made a day before your party. Start out with a clean fishbowl. You could call it a salad bowl, but it’s really a fishbowl…but ours has never even seen a fin. (I bought it at Michael’s arts and crafts store). I used one package of mini marshmallows for this recipe. It’s not really a recipe, just kind of a throwing-together of ingredients. I don’t think there’s really anything that you could do to mess this one up! 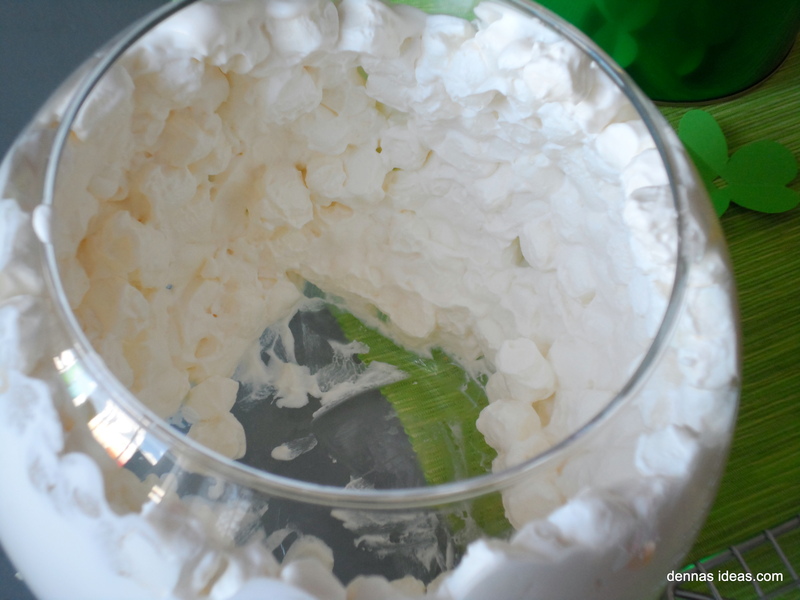 First whip up some whipping cream…the real stuff!! (with a bit of sugar and vanilla, nice and thickly whipped) Like maybe about two cups. (Or more!) In a very large separate bowl, mix about half a bag of mini marshmallows and about half of the whipped cream. It should be a thick mixture, not runny at all. 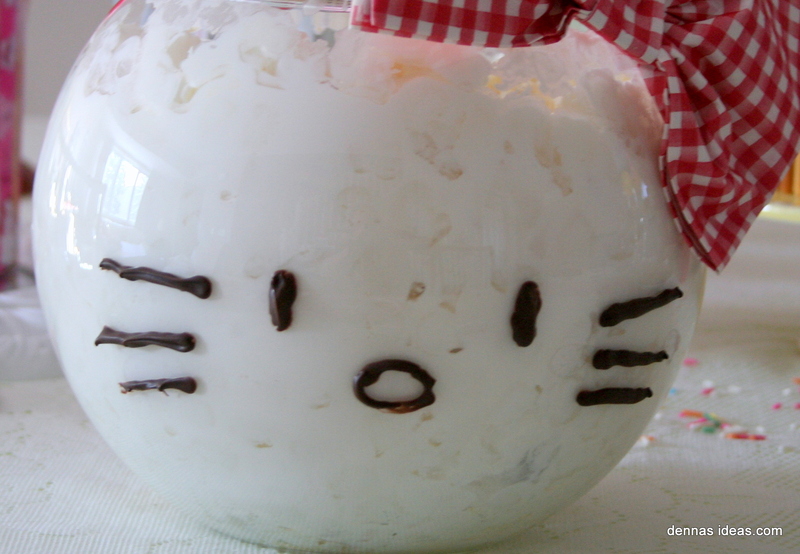 Now with a big spoon, start spooning this into the fishbowl, and coating the sides of the bowl, like this… This is so that Hello Kitty will have a nice smooth-looking face, instead of grape “beauty marks or warts” on her face! Coating the sides of the bowl with the marshmallow/whipped cream mixture is quite easy. 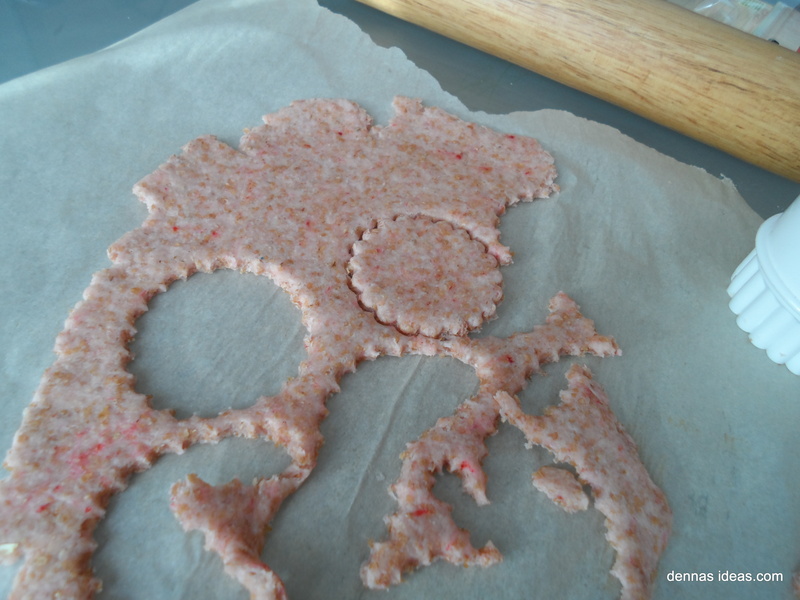 Try to make it as thin as possible, so you have some more mallow for the salad! Now to finish the salad: mix up the rest of the marshmallows with the whipped cream. There’s a healthy short cut you can do here. I added in plain greek yoghurt and/or plain vanilla yogurt instead of some of the whipped cream. 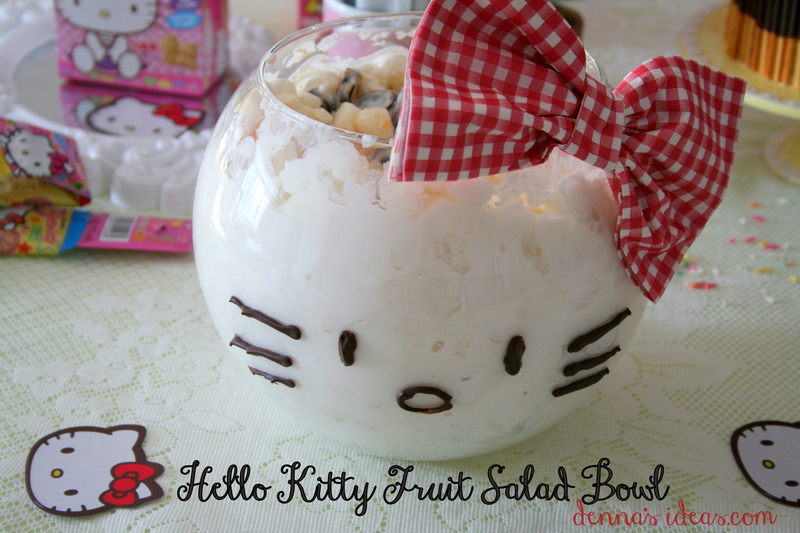 It works great….really, I think this salad could be made with only yogurt and no cream and it would be just great! But I don’t think cutting out the marshmallows is an option! Now cut up and de-seed some grapes. A big bunch of grapes. We like using the red grapes. Make sure each grape is cut at least in half! Add these to the mix in the big bowl. Add some mandarin orange segments (maybe a can-ful or two). (I didn’t have any, but you can add a can of pineapple chunks, too). You kind of add what you have on hand, fruit wise. Now it’s a fruity marshmallowy salad. To give it a nice nutty crunch, add some toasted almonds now (might be a good idea to have these toasted before you start making the salad). Almonds: to peel whole almonds, put them in a bowl and pour boiling water over them. Let sit for a few minutes, then start popping the skins off them…that’s the fun part that kids usually like helping with! After they are all peeled, toast them in an oven or in a skillet on top of the stove….just a warm toasty brown, don’t let them burn!! When they are cool, add them to the salad. That’s about it for the fruit salad! Mix it all gently together and spoon it into the fishbowl. It made just enough to almost fill it. Now cover and refrigerate it. The next day, right before the party, you can add the face and bow. The bow was made from a paper napkin/serviette. Cut a strip off one side, gather the large rectangle up, then use the strip to fasten around the middle and tape together. Use a small piece of tape to stick it to one side of the bowl. 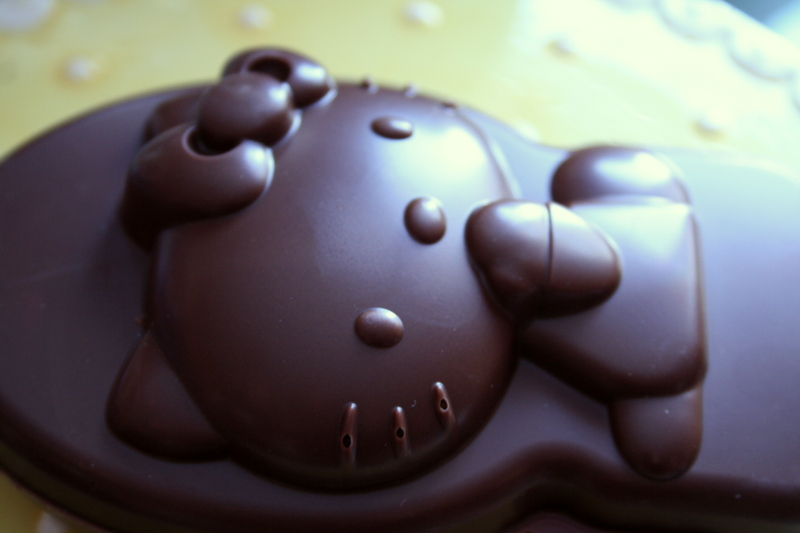 For the face: melt a couple of cocoa candy melts (I use Wilton’s), or a few spoonfuls of chocolate chips. Put into a plastic baggie and snip a tiny piece of the corner off so you can pipe the chocolate out there. The fruit bowl is nice and cold so the chocolate will set up quickly. Pipe the whiskers on first, then the eyes and nose…. I think the eyes should have been down a bit….oh well, it took just a minute to do right before the party started. If you mess up, you can just scrape it off and start again. I found that the chocolate stayed on perfectly for a long time….the only problem was that the kids wanted to pick it off and eat it!! Right before eating time at the party, you can gently mix the salad up, or even just mix it up as you serve it…so that there is fruit throughout the whole salad. Mmmm, love this salad!! And the Kitty, too! I was especially pleased that this was my very own little idea…I didn’t “find it on Pinterest” like most of my ideas, haha! !